Lots of people are asking us this as our trip draws near. I'm telling them all the same thing...PRAY! :) Because that's really all we need. However, I also have a very practical thing that will help the children that we will leave behind at Kirill's orphanage. Kirill's orphanage is very, very poor. They need so many things. They depend on adoptive families to provide these needs. We will be the first family in SEVEN YEARS to adopt from this orphanage. So they haven't gotten much in the way of donations in the past seven years. A little about the orphanage...it houses 98 (soon to be 97 :) ) children with special needs, ages 4-18. They do get some humanitarian aid, but I can tell you from what we witnessed first-hand, they are very poor and need so much more. Greg and I will be taking money with us on our trip and purchasing items in-country to give to the orphanage. It's just easier/more practical to do it that way because of cost to ship or check the luggage we would need to carry donations. Also, the orphanages have specific things that they need at specific times due to the special needs of the orphans housed there. So until we go, we won't be sure of what the needs are at this time. If you would like to make a donation, we will use it to purchase things like diapers, medical supplies, therapeutic toys, books, sheets, clothing, food/snacks, etc for the orphanage. We would love to overwhelm them with donations of things that they so desperately need. My hope is that we can buy enough to fill our car with things for the orphanage each day that we make a trip out there while we are in country (two trips). Heck, we will rent a van if need be. I have a PayPal account to make it easy for you. Just send donations via paypal to tesneydavis(at)hotmail(dot)com. Or if you want to mail us a check, that will work too; email me at the same email address and I will send you our mailing address. I promise the money will be used for these precious children that need it so badly. Will you consider making a donation? Nothing is too small. Aren't We All a Little Schizophrenic? Brace yourselves. This may be a long one. God is constantly convicting me of sin in my life. For example, a couple of years ago I was listening to a morning radio show and the hosts were talking about how they had given up their football passion because it had become an idol to them. I thought to myself, "Well good for them, but not me. Football isn't a problem for me...it's entertainment. I'm a fan. There's nothing wrong with that." But a seed was planted. It was kind of like the pea under the princess' mattress. I kept being bothered by it and it made me uncomfortable. So recently, I've had a real change of heart about football. I've realized I need to see it for what it is in my life: an idol. It's hard. Very hard. I grew up on football in the South. I love it with a passion. But I've been so bothered by the obscene amounts of money I've spent on it, the time I've wasted on it, the way I feel about the other team and how I see people mistreating each other in the name of football rivalry. Now if you have known me for very long, this is kind of a big change for me. So it may look a little schizophrenic when I have always been an outspoken fan of my football team, then I suddenly change my position on the whole football fanaticism issue. It may seem hypocritical to some at first. I can't control the way it is perceived; I just have to do what my heart is convicted to do. Obviously from the message I received that I referenced earlier, at least one person perceived that in a negative way. Similarly, I have been extremely materialistic in the past. In fact, I STILL AM. Confession: I really like "stuff" and I battle with Satan every. single. day. over it. Sadly, sometimes he wins. Does this mean that I can't speak out against materialism? Does it mean that just because I don't have complete control over my own materialistic nature I can't challenge myself and others to do better? I don't think so...I think Jesus used people who didn't have their act together all the time. If he didn't, he wouldn't have anyone to spread the Gospel. In fact, he kind of uses the most unlikely people sometimes...the worst sinners, the least of these, and even people who started out as his mortal enemies. The truth is, I'm a work in progress. I'm a HUGE mess. The people who know me best can vouch for that. I have maybe three or four friends who know the good, bad, and ugly about me. All of it. These people could tell you that I have sinned in ways that are TERRIBLE. Let's face it...we are all just big 'ol piles of poo...but God loves us so much despite everything we do to try to mess up our lives. I take great comfort in that, don't you? This is not a photoshopped image. 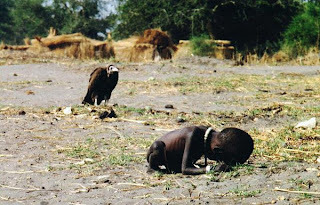 It is a real picture taken by Kevin Carter. It has changed me. It haunts me at night. It makes me wrestle with things that make me very uncomfortable. It's a little girl, dying of starvation in Sudan, and a vulture in the background waiting to pick her bones clean. Images like this make me realize something. Being quiet is not an option for me. It just isn't. Even as I struggle with how to flesh it out in my own life, I will unapologetically advocate for human beings. This little girl had a soul. Who is responsible for her? Who will speak up on her behalf? If not me, then who? Can I really ever say too much about how much people in this world need us...aren't we supposed to be Jesus on this Earth? When I ask myself those questions I realize I really don't have time to bother with what people think of my "world views". Even if I seem a little schizophrenic. I won't answer to them when God asks me what I did for the least of these. I feel an urgency to be outspoken for them, and for that, I will not apologize. In order to adopt a child from a foreign country, you have to fill out a petition with the United States Citizenship and Immigration Services (USCIS) to classify an orphan as a member of your family, which in our case is called an I-600A form. 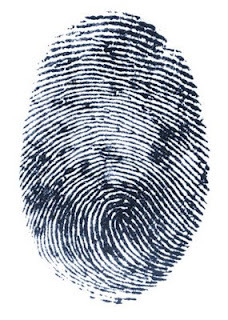 A part of the process of getting approved is doing biometric fingerprints, or FBI prints. 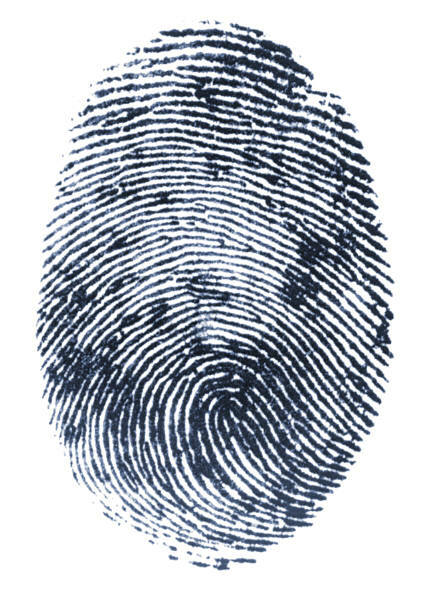 These prints are only good for 18 months, then they delete them, and your USCIS approval is expired. So, we got our USCIS approval back in November of 2009, when we were in the beginning stages of the adoption process. Never in a million years did I think they would expire before our adoption was finalized! But alas, they expire February 27th, so it was necessary for us to have them re-done. We have known this was the case, but our adoption agency kept telling us to hold off on having them re-done because they kept thinking we would get a court date before they expired. Well, you all know that story if you've been keeping up with our adoption. If you're new to this blog go back to August 2010 and start reading there to catch up. We held off until we KNEW there was NO WAY we were getting a court date before they expired, sent off our request, and got our fingerprinting date...February 7. However, due to who-knows-what, we were told that the USCIS was backed up on printing and it could take up to three months to get our prints back from the date they were taken. Since our court date is March 17th, we couldn't wait three months. Our agency advised us to start PRAYING and call our Senators and State Representatives to ask for help getting the prints expedited. We called both Richard Shelby's and Jeff Sessions' offices. Both were very helpful, but I have to say, Richard Shelby's office was incredibly responsive. We called them before we got printed and they told us exactly what they needed to help. So as soon as our prints were taken on Monday, we emailed them and let them know the prints were done. We were told it would take at least 48 hours just for the prints to get into the system so we didn't expect to hear anything back from them for a couple of days. Imagine our shock when LESS THAN 24 HOURS LATER...ON TUESDAY MORNING, THE 8TH, RICHARD SHELBY'S OFFICE CALLED GREG AND TOLD HIM THEY JUST GOTTEN OFF THE PHONE WITH USCIS, THE PRINTS WERE DONE AND OUR USCIS APPROVAL WAS IN THE MAIL!!! I have to give huge props to Shelby's office for their kindness and responsiveness, but we all know all the glory goes to God for making this happen. It was like God was just saying, "See? I got this. Don't worry and don't be afraid." Just another MIRACLE in Kirill's story. God works so powerfully through the least of these and I'm so humbled to get to be his mommy. One last thing...we've been working on our plane tickets this week. Can I just say how exciting it's been to book two round-trip tickets and one one-way ticket? When we got the itinerary with "Gregory Kirill Davis" printed in black and white, I almost broke down. It makes it so real. One month from today we will leave to go get him...I CANNOT WAIT! Now that we have our court date (ah...I still can't believe I'm typing that...SO THRILLED! THANK YOU GOD! ), what happens next? Well, the first thing we have to do is KEEP PRAYING. We still have a lot of steps to bring K home for good, so keep your prayers going strong. They are powerful and effective! Pray that God continues to be glorified through our adoption and K's life. We KNOW beyond a shadow of a doubt that he has already been such a testament to God's name. We will travel to K's country, to the capital city, and have medicals done there with 8 medical specialists. Once we are done with that, we will travel to K's region for our court date. Once we get there, the first day, we will complete final court paperwork and visit with K!!! MY HEART IS ABOUT TO EXPLODE JUST TYPING THAT...WE WILL SEE HIM IN A LITTLE OVER A MONTH!!! :) :) :) The next day, we have court. If we are approved, that will begin a 10-day grace period. That time is designed to give anyone a chance to object to the adoption. During that time, we will come back home. We could stay, but we will be missing Clayton so much and we feel that we need to come home to see him. Plus, those 10 days would be pretty difficult. There isn't a lot to do in K's region; it's a beautiful city but it would be hard to fill 10 days there. We wouldn't necessarily be able to visit him everyday if we did stay because of travel to and from the orphanage. It takes a couple of hours to drive there from the city and we would have to hire a driver each day, which would be very expensive. So for all of those reasons, we will come home. We will return to K's country after the 10 day grace period and the first thing we will do is go to his region and pick him up! He will be ours at that point. :) :) :) We have to complete some post-adoption paperwork there, then we will go back to the capital city. In the capital, K will have a medical exam done. Then we will have to register K with the consulate and get his passport and visa. Once we get all of that done, we will come HOME! :) I'm not posting exact dates on here for privacy's sake, but we will be home sometime the first week in April. Thank you all so much for your continued prayers. Our family is completely overwhelmed with the outpouring of love and support we have received. I'm terribly behind on responding to all the Facebook messages, emails, texts, and phone calls. Please know that it's only because there aren't enough hours in the day to respond immediately but I will do my best to respond eventually. We need these words of encouragement so much. YOU have been Jesus on earth to us and for that we are humbled and so, so grateful. God is so good. His plan in all of this is unfolding. I can't share all the details yet, but we are finding out things that are blowing us away. God has been working very hard behind the scenes in ways that we could have never imagined. I can't wait to tell you more! That's all we know. But we have a court date and it's March 17th!!! PRAISE GOD! HE IS FAITHFUL...MOUNTAINS MOVED! When we committed to adopt, we knew there would be two trips with a period of waiting between the two. We didn't anticipate the wait to be terribly long; maybe three months at the most. We are now beginning the seventh month since we saw our son. It seems like an eternity ago, and most of the time I cope with the wait by NOT thinking about it. I try to stay busy and occupy my time and mind with other things; Lord knows I'm good at staying busy! But sometimes I let myself just dwell on the time we spent with K. I let myself go back there with all five senses and just grieve the fact that he's still not home. Sunday was one of those days, and honestly, I've had a hard time coming out of it. I just ache to touch, smell, hear, and see my son. I'm dying to kiss his face and snuggle his fragile little body. The main thing that I can remember is the way his head felt. He has really fine blond hair that is buzzed close to his head (that's how all the children...girls and boys...have their hair cut at the orphanage where he lives). I just kept stroking his hair and trying to burn the way it felt into my memory. His body was cold, like a corpse. I kept trying to wrap my arms around him to cover his cold skin and warm his tiny frame. His smell was distinct. He didn't smell sweet like Johnson and Johnson Lavender Baby Wash. Frankly, he smelled like urine. The first day his diaper was so full that its contents spilled out onto his clothing and mine. I was wet from his urine and saliva. K kept his hands in his mouth all the time. His hands were raw and bleeding from being in his mouth so much. His thumb was cracked, red, and covered with open sores. His ears were also raw with sores inside because he usually kept whatever hand wasn't in his mouth in his ear. But I didn't care at all. In fact, I didn't want to wash the pants that I had on for a long time because they smelled like K. He reeked of human excrement and soured clothing, but to me it was the sweetest smell in the world. K didn't really look like the pictures we were given. He was much thinner and smaller than I expected. In his photos, he looked plump-faced, pink and healthy. In real life, his eyes were purple and his skin was mottled. The sparkle in his eyes from the pictures wasn't there. There were sores on his body where he had picked and scratched his own skin; probably for stimulation. He was wearing girls clothing and shoes. He had on the same dirty shirt both days we visited with him. His glasses were gone. We were told because other children would grab them and break them. He obviously couldn't see well because when we would give him toys, pictures, or a book he would bend down to put his face right up to it so he could see it. He was a beautiful, beautiful boy. I haven't seen such beauty since I first laid my eyes on Clayton. K didn't talk at all. He grunted and hissed to show is pleasure or dislike. He giggled when we tickled him. I played with his feet, doing "patty cake" with them. He banged them together as if to say, "again! again!" So we played that game as long as he was interested. Although we couldn't talk to each other, we had no trouble communicating. I love to watch the videos of our time with K because I can hear his sounds. To me, it sounds like a beautiful song. The four hours we spent over two days with our son was a blend of exhiliration and agony. Every second was a treasure because we knew, at any moment, the orphanage social worker would come in to tell us our time was up. Every second I frantically tried to file away in my memory because I knew it was all I would have of K until we returned to bring him home for good. Now as we begin our seventh month of waiting, it occurs to me that this must be how God feels about us. We are dirty, covered in our own filth, but God thinks we smell like lavender body wash. Our feeble attempts to talk to God come out as grunts and hisses, but he hears them as a sweet symphony. We must look terribly unkept in comparison to the beauty of God's surroundings in Heaven, especially the way we abuse our bodies and minds with worldly things. Yet he thinks we are beautiful. He's frantically soaking in every second we choose to spend with him, knowing that we will soon return to the orphange of this world and all its depravity. All he wants is to bring us home.